3rd and Long for Manziel? Not that long ago, I tweeted out that I think we hold athletes up on such a pedestal that we are disappointed when they don’t live up to our standards. Regardless of what I think, athletes today are bigger than the game they play. Let’s be realistic, everyone can say they aren’t, but their contracts say other-wise. According to Forbes, Cristiano Ronaldo is the highest paid athlete in the world at $88 million per year. Lionel Messi is the second highest at $81.4 million and the King, LeBron James ranks third at a paltry $77.2 million. When you’re at that elite level, you play by other rules. These performers are built different, carry themselves differently, and do things on the field that elevate them to, dare I say, Idol status. While these are only three examples, millions of others start playing sports at a young age and once their talent goes beyond local hero, their names become synonymous with the high schools or colleges/universities they play at. We’ve seen it with Tim Tebow, who has achieved a level of fame no one can fully understand. Mr. Florida hasn’t even appeared in a NFL game since 2012, but his name is recognized all over the world. He may not flaunt his fame, but he uses it to help those in need. On the other end of the spectrum is Johnny Manziel. He had it all. He achieved legendary status at Texas A&M after winning the Heisman Trophy after his uber successful freshman year. Cocky and arrogant, he could back it up on the football field. As an instant celebrity, his future was all but laid out for him. Unfortunately, the signs of things to come were evident. As a future first-round NFL Draft pick/money making machine, the blinders were put on. Now, there is nothing saying he wasn’t doing what every other college kid was doing. He was the life of the party, had the fame, had the girls, and everything else that came with it. In 2012, the 19-year-old freshman was arrested after getting into a fistfight and was in possession of a fake ID. After winning the Heisman later that year, Johnny “Money” Manziel’s celebrity status was more of a focus than his performance on the field. TMZ was posting photos of him on their website, he bashed College Station on Twitter, was a no-show at some of the Manning Academy coaching sessions where he was a celebrity coach, was filmed getting tossed out of a frat party, and of course, the allegations of receiving cash from memorabilia sales. The list can go on forever. Even more disturbing was when Wright Thompson published, “The trouble with Johnny”. It reveals the constant circus surrounding a kid and the drinking to cope with stress. The fame was always going to be there. Could he deal with the hurricane continually engulfing him? 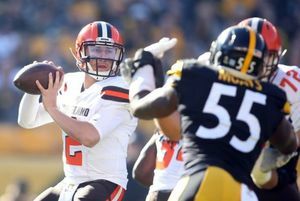 Since being drafted by the Cleveland Browns in the first-round of the 2014 draft, things have deteriorated more than anyone could imagine. Right in front of our eyes, we’ve witnessed the self-destruction of one of the greatest college football players who has ever lived. Social media is a part of our lives. The constant flow of information at our fingertips is good and bad. Gossip spreads like wildfire and risque photo’s that seemed like a good idea at the time are in cyberspace forever. So, when Manziel does something off the field, it becomes the highest priority. Now, was Manziel at fault? Of course. Do we as society play a role in it? You better believe it. To everyone Johnny Football is great television. He’s living the life we all dreamed of as kids; the lavish lifestyle in addition to a job where you get paid millions of dollars. His skill and ability kept detractors at bay for a short time. If it was us we’d be in jail or would have lost our jobs many moons ago. 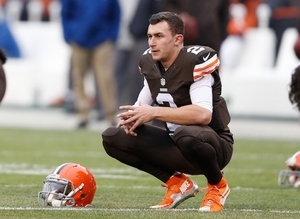 From his first day in the NFL, Manziel has been under the microscope. Cleveland Brown fans have been hoping for a winner for years and this was supposed to be their guy, the guy to take them to the promise land. Unfortunately, those Browns fans longing for a winner, saw only brief glimpses of what made Manziel the toast of the town at A&M. In eight professional starts, he’s compiled a 2-6 record while tossing seven touchdowns and five interceptions. His best performance came in a 30-9 loss to the Pittsburgh Steelers. 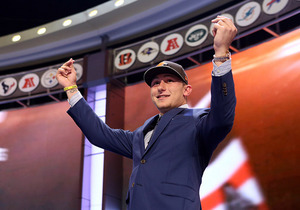 Manziel threw for a career high 372 yards, completed over 70 percent of his passes and had a passer rating of 95.8. It’s a real possibility that his performance against the Kansas City Chiefs in week 15 was the last time we’ll see him on an NFL field. A 13-32 performance for 136 yards is what it is, but his 11 rushes for 108 yards is impressive in any league. His cavalier style proved well in college, but as a QB considered undersized for his position, running around like that can get you in trouble. After suffering a concussion during the Chiefs game, Manziel was ruled out for the remainder of the season. There have been many first round picks that never lived up to expectations; JaMarcus Russell, Tim Couch, Tony Mandarich, Akili Smith, Ryan Leaf, and Justin Blackmon to name a few. To say they accomplished anything on a professional level is a dangerous statement. Yes, they were high profile picks and were paid a lot of money, nevertheless, they were among an elite group that played in the one of the most competitive organizations in the world. If they never scored one touchdown or got one sack, each person still achieved a pretty amazing thing. Manziel’s an extremely polarizing figure that excelled at the college level, but that never translated to success in the NFL. At this point in time, Manziel’s antics off the field will be what he’s remembered for unless he changes his lifestyle. From the money phone, to the inflatable swan, multiple party pictures, his highly publicized entry into rehab (2015), and being indicted on assault charges, his reputation has taken a major hit. That’s an extensive list and occurred within a two year window, not a lifetime. Recently, reports have surfaced that Manziel’s in rehab again. Good news, yet there is still negativity surrounding him when he’s trying to turn his life around. Obviously people aren’t a fan of his and things really can’t get much lower for him, still, this is where he can transform his life and turn those naysayers into believers. If Manziel is indeed in rehab, it’s a great first step. He needs to follow through with his promise, surround himself with the right people and get his life on track. The talent is there and the responsibility lies with him. This comes down to Johnny Manziel doing what’s best for Johnny Manziel. Not for the fans and especially not for all the celebrities he surrounds himself with. ← New Indy league hoping to buck the trend?